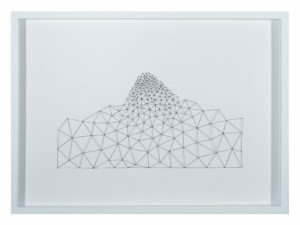 James Harris Gallery | "New Measures"
James Harris Gallery is pleased to present New Measures, a group exhibition featuring contemporary Latin American artists Thomas Glassford, Pedro Tyler and Mariano Dal Verme from Sicardi Gallery, Houston. 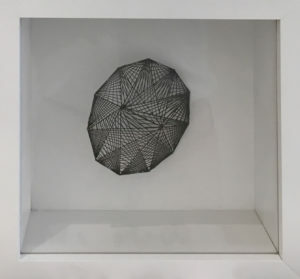 Working with everyday items or craft materials, these artists transform these objects into geometric motifs and modular abstractions, destabilizing their function and concrete physicality. The use of common materials imbues the work with its own history, evoking a sense of familiarity and intimacy or perhaps nostalgia within the viewer. 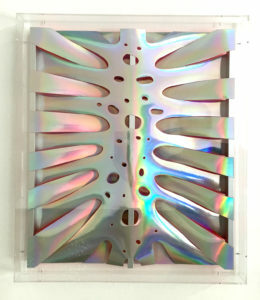 Rendering natural phenomena and cultural constructs through formal abstraction, the decidedly physical and tactile nature of these sculptural reliefs and three-dimensional forms dissolve into the conceptual realm. These artists also play with our perceptions, raising questions around our physical relationship to the work in space and challenging rational systems of order. Thomas Glassford’s early sculptures were based on local and natural materials (dried gourds, leather, wood), but he has increasingly turned to more industrial and urban materials. Both examples of his work are included in this exhibition. His Stela series is made from broomsticks mined from the back alleys and dumps of Mexico City. 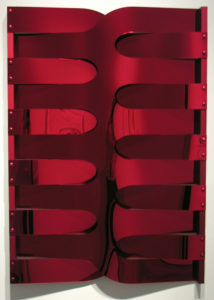 He presents these works as monuments, as “timeless objects emblematic of civilization and daily life, bearing the patina of the many hands that possessed them over time.” The aluminum sculptures in the show create rhythmic wall reliefs that refer to the urban landscape while partaking in a dialogue with the vocabulary of minimalist painting, musical composition and modernist architecture. Glassford also suggests a microscopic scale for his work, where these everyday, manmade objects represent organic system of cellular biology. In the Stela piece, the linear form of the broomstick becomes a representation of the diatom, ribbon like formations of cell colonies. Similarly, the aluminum work Red Distichous refers to the two-ranked leaf arrangement, an alternating pattern of leaves around a central stem. The work of Uruguayan-Chilean artist Pedro Tyler intends to achieve a “symbiosis” between the imagination, reality and the symbolic, through the use of a common material: the measuring tape or ruler. Tyler is interested in the history of systems of order and reason, formulated by Enlightenment thinkers Descartes and Spinoza. For these philosophers, there were differing opinions around the separation between the immaterial and the material. Tyler’s sculpture embodies this fundamental concern in the history of Western philosophy, offering the tactile and familiar object of the ruler while at the same time challenging our physical relationship to it. Tyler’s formal arrangements of this object transcend its functionality, offering both a sensory experience and symbolic interpretation of these industrial instruments. 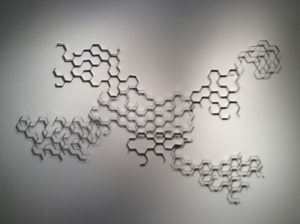 His laboriously constructed chain work Razon Suficiente refers to Descartes chain of reasoning, but its fragility suggests the failure in this way of thinking. Like Glassford, Tyler is also concerned with scale, realizing sculptural interpretations of a grain of sand or molecular bonds – where the infinite can be expressed through the microscopic. 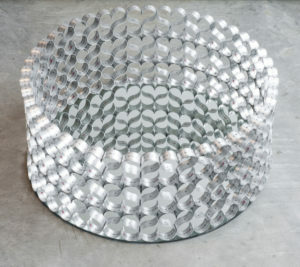 Tyler intentionally intervenes with the tangible experience of his work. Gravity suspended, the delicate wall reliefs seem to float in space and his use of reflective surfaces disorient the viewer, allowing for the real and the symbolic to coexist through this corporeal interaction. Argentinian artist Mariano Dal Verme has been exploring the discipline of drawing for over a decade, experimenting with how a drawing might be constructed in alternative ways. 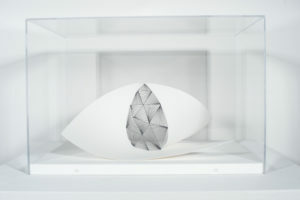 By offering a literal interpretation of a definition for drawing that was described by a curator at the New York Drawing Center as “a unique work of graphite on paper”, Dal Verme creates three-dimensional forms out of these common craft materials. By deconstructing the medium into its basic elements of material and line construction, this work acts as an intervention that examines the limits of the tradition of drawing. 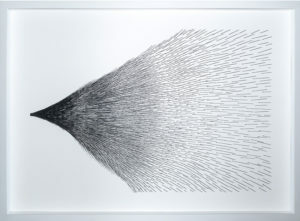 Dal Verme highlights the fragility of these materials in his small-scale sculptural works, delicately constructed out of graphite sticks and folded or cut up drawing paper. 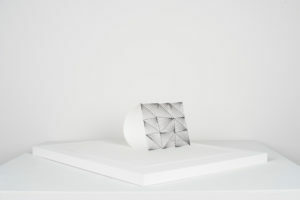 Despite the tactile nature of this work, there is something impossible in their existence. Free from disciplinary constraints, these pieces suggest that their function and purpose lie in the act of their own creation, as perhaps experimental architectural models that don’t obey the laws of physics or as physical renderings of a virtual space. Dal Verme’s imaginative reinterpretation of this artistic practice has a utopian air of boundlessness; what begins as a material concern is transmuted into an ontological endeavor. In this exhibition, Tyler, Dal Verme and Glassford renegotiate the physical experience of their work by transmuting materials into formal arrangements that resonate with natural and psychological patterns that exist both internally and in the world around us. The works’ physical presence, in both monumental and miniature dimensions, is of great importance to how we perceive them. 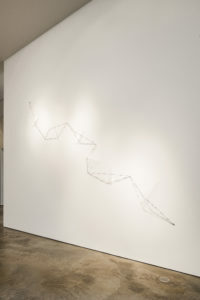 At the same time, there is a failure in their physicality, as Tyler laments while referring to his material, “ironically, a measuring tape can measure this body but not the feelings inside it.” The artists offer alternative solutions, but the full meaning of each piece must unfold in relation to the beholder and the surroundings in which they are exhibited. 4 3/4" x 16" x 16 1/4"
15 3/4" x 27 1/2"
118" x 36" x 12"
21 1/2" x 18 1/2" x 1"
45 1/2" x 32 1/2" x 2 3/4"
21" x 29" x 2"
4" x 9 3/4" x 13 3/4"
9 1/2" x 8" x 13 3/4"
9 1/4" x 9 1/4" x 3 1/2"